At Cosgrave Vergeer Kester LLP, our law firm has successfully been able to represent clients in Bend, Oregon, using many different approaches to conflict resolution. Arbitration and mediation are two of our attorneys’ main strengths, regardless of the circumstances involved. We regularly seek to find peaceful agreements to legal disputes, whether we are handling a taxation case or real estate law matter. In the event we cannot obtain a favorable settlement outside of court, we are fully prepared to represent our clients’ interests in litigation. Our 81-year history includes excellent results in more than 800 trials for a broad array of industries. With a thorough understanding of economy and government in the Pacific Northwest, our attorneys bring unique, insider knowledge to cases of all kinds and complexities. Our law firm regularly advocates for individuals and businesses with matters involving commercial transactions, construction services, coverage opinions, employee relations, environmental law, toxic torts, estate and trust planning, personal injury and property damage liability, financial services and compliance, product liability, professional liability, real estate law, and regulatory and taxation. In addition, we are available to represent clients before the federal and state Supreme Court in appellate proceedings and litigation. With prior experience as district deputy attorney and assistant attorney general, our attorneys are undaunted by high-stakes scenarios. 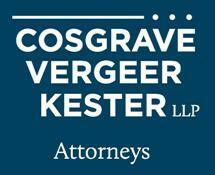 Although Cosgrave Vergeer Kester LLP is located in Bend, we are pleased to welcome clients from across the greater Portland metropolitan area. In a commitment to expediency and streamlined service, our law firm accepts credit cards as payment.